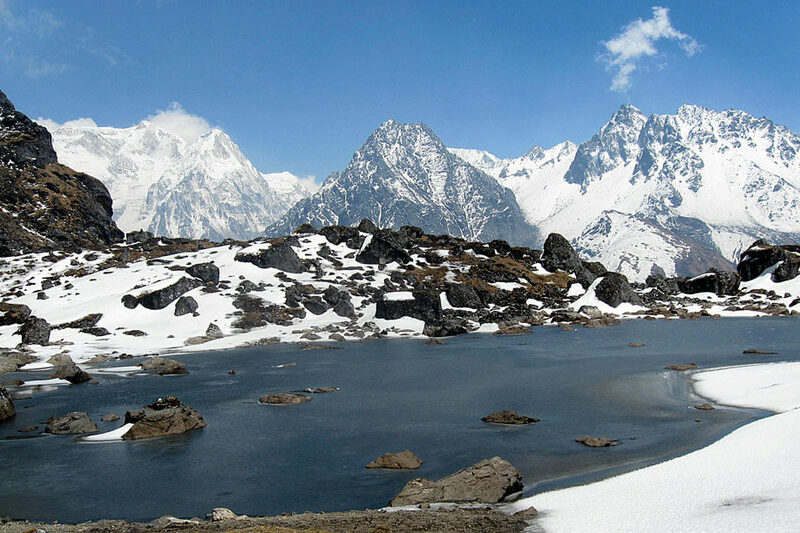 Kanchenjunga trek is an awesome adventure to the wilderness in the far north-eastern part of Nepal. 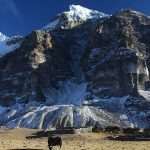 The three-week long trek takes us to the foot of Mount Kanchenjunga, the third highest mountain in the world at 8596 meters. The trek passes through isolated areas with thick forests and rural settlements, providing tranquility to solitude lovers. 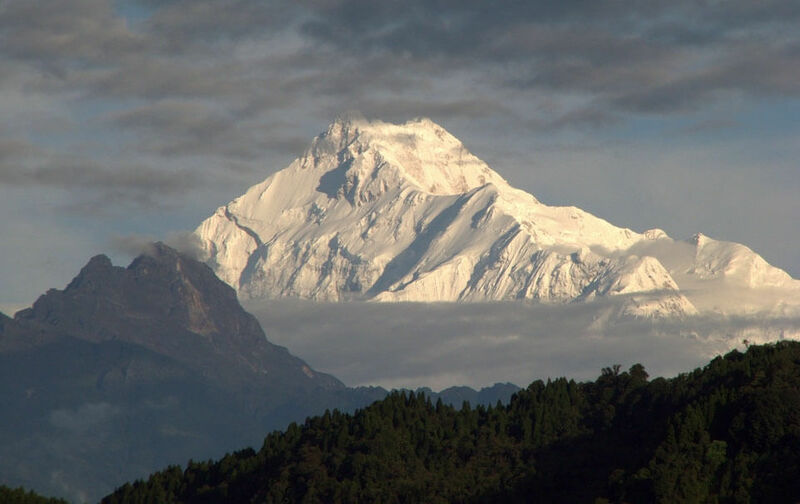 Kanchenjunga translates to “Five treasures of the snow” which refer to the five summits that make up the peak. 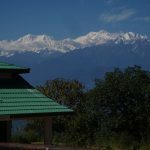 Kanchenjunga is considered to be one of the most majestic massifs in the world and the sight from the base camp is a truly memorable experience. 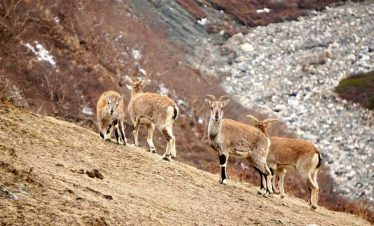 The three-week long trek with tricky trails is considered difficult and demands physical fitness and determination from the adventure seekers who attempt it. 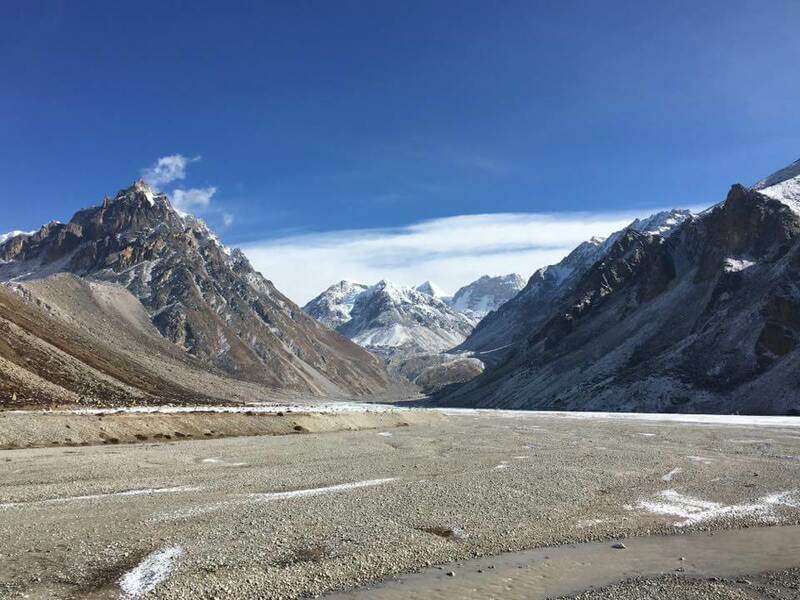 We reach a maximum elevation of 5388 meters at the base camp which means that the trek requires proper consideration for altitude sickness. 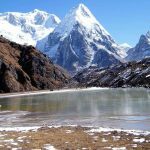 Kanchenjunga is a comparatively isolated region that was opened to trekking only after 1988 which makes the flora and fauna as well as the traditions of the region unaffected by the modern world. The biodiversity is still intact and the traditions of the people give us a glimpse into the mountain lifestyle. 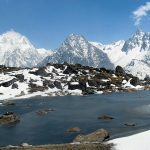 The trails are marked by different rivers that meet and separate at different points and the formidable glaciers that are a sight to remember. 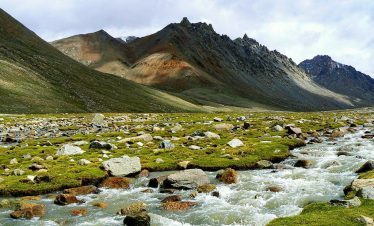 The trip made up of valleys, rivers, forests and summits towering way over 7000 meters is a heavenly one-of-a-kind adventure. You will enter our beautiful country via Tribhuvan International Airport in Kathmandu. One of our representatives will transfer you to the hotel. You can enjoy the nightlife and authentic Nepali cuisine for dinner. You spend the night at an elevation of 1300 meters. We explore the different UNESCO enlisted world heritage sites in Kathmandu valley on this day. We visit Pashupatinath temple, Boudhanath stupa, Swoyambhunath stupa, Patan Durbar Square, Kathmandu Durbar Square, Bhaktapur Durbar Square and Changu Narayan Temple. All these sites have huge cultural, religious and historical significance to Nepal as well as the world. After the tour, we will shop for gear and other personal items required for the trek. All other preparations for the trek are also completed on this day. From Kathmandu, we take an early morning flight to Suketar in the eastern part of Nepal. Once we land at the airport at 2420 meters, we make our way though lush green forests to Lali Kharka at 2265 meters. We spend the night here. From Lali Kharka, we make an easy descent to Phundrawa. Then, we take a steep climb to Yangpang. From here, the trail is easy as we ascend to Phumphe Danda and then to Khesewa. After passing through forests and villages throughout the day, we spend the night at 2120 meters in Khesewa. We begin our trek early in the morning towards Kabeli Khola. We walk through forests and reach a small stream. The trail also passes through several villages as we enjoy the Himalayan vistas. We spend the night in Mamankhe at 1785 meters. We move along Kabeli Khola most of the day. We make easy uphill climbs as we encounter ridges, streams, and waterfalls. We cross a small suspension bridge and pass through several small villages before reaching Yamphudin. We spend the night here at an elevation of 2080 meters. We follow a local route that passes through terraced fields and green meadows. As we admire the Himalayas, we walk along Amji khola and then cross a pass at Lassiya Bhanjyang. We finally reach Tortong at 2995 meters where we spend the night. We begin a straight climb from Tortong beside Simbuwa khola. As Tuplung peak comes into view, we make our way across Lalung valley. 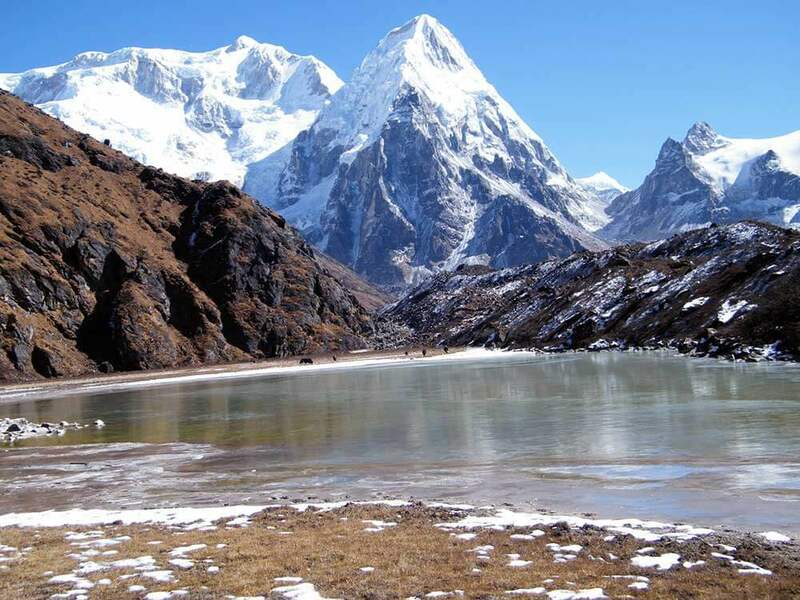 As we pass through rhododendron forests, the magnificent Yalung glacier can be spotted. We finally reach Cheram at 3870 meters where we spend the night. As we cross the 3000 meters mark, we rest in Cheram for a day to acclimatize. We can choose to either rest or go for short hikes. We take short trips to areas around Yalung. There are also viewpoints from where we can enjoy the Kabaru and Rathong peaks. We return back to Cheram and spend the night there. 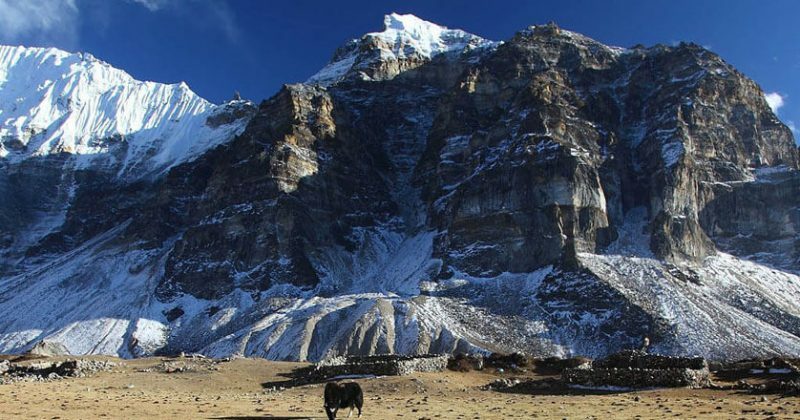 After a short ascent from Cheram, we reach the snout of Yalung Glacier. 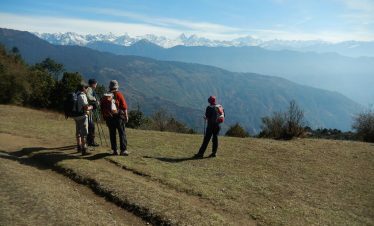 We walk through a valley trail, past small settlements with beautiful Himalayan views as we reach Lapsang. After a while, we reach Ramchaur at 4580 meters. We spend the night here. 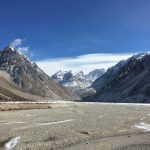 From Ramchaur, we move along the valley and follow a stream till we reach a moraine. 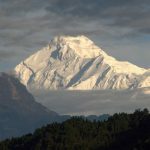 We climb to the top and see the southern face of Kanchenjunga and Jannu Himal. After passing Oktang monastery, we finally reach Yalung Base camp at 4500 meters. 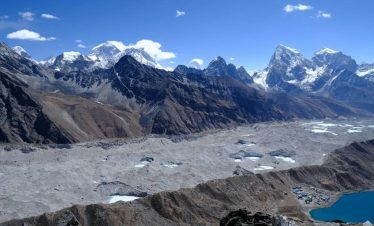 From the base camp we admire the views of peaks like Jannu and Nyukla Lachung. After a while, we descend and spend the night in Cheram. The day comprises of 4 different passes at varying distances. We first cross Sinelapche Bhanjyang, Mirgin la pass, Sinion la pass and then finally Sele la. 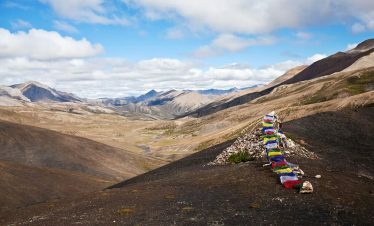 The trail to Sele la is decorated with prayer flags. We cross the pass at 4290 meters. We spend the night here. We start our trek to the north early in the morning. After passing Tangbgharma Danda, we reach a chorten with prayer flags. After that, the trail becomes steep as we descend through rhododendron, birch and pine forests. Finally, we reach Ghunsa at 3595 meters. It is a beautiful village with unique houses of pine walls and prayer flags. We spend the night here. From Ghunsa, we proceed further north as we enjoy the mountain scenery. We pass through meadows and rhododendron and pine forests. We cross a bridge in Rampuk Kharka, walk past a waterfall and some tricky trail before reaching Khambachen. We also see beautiful views of Mt. Jannu along the way. We spend the night at an elevation of 4050 meters. The day is a challenging one as we make our way through rocky fields and boulders. We follow the riverbank and reach a stream. After crossing a bridge, we reach Ramtang monastery and then a tricky landslide section that we cross steadily. After that we drop to the river and after a while reach Lhonak at 4780 meters. 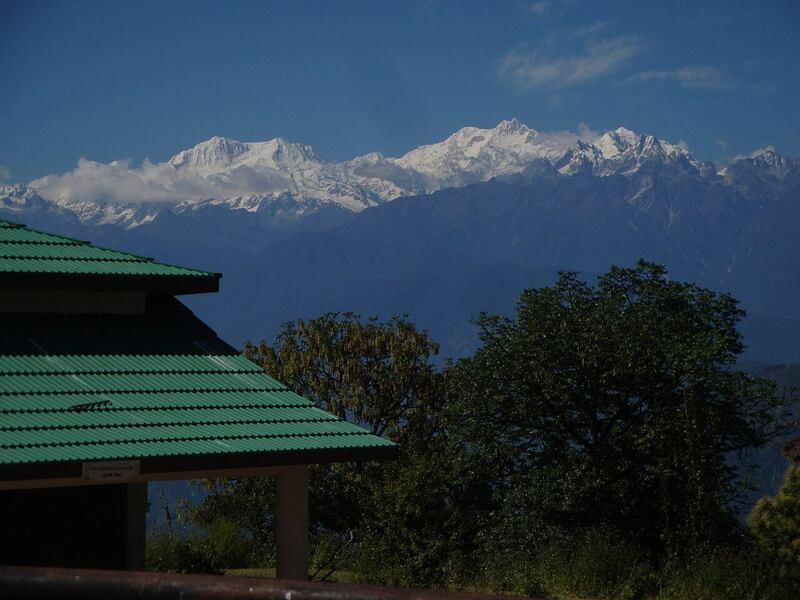 From Lhonak, we make our way towards Kanchenjunga base camp that passes alongside Kanchenjunga Glacier. We reach Pangpema and then descend to the base camp. The view of the Himalayas including Kanchenjunga and Jannu Himal is worth every step of the trek. 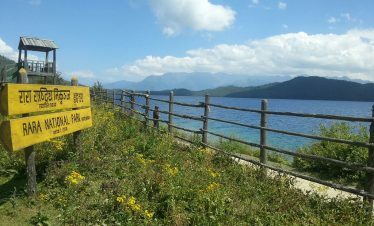 After a while we return back to Pangpema and spend the night at an elevation of 5143 meters. We trace our steps back to Lhonak and spend the night there. From Lhonak, we make our way towards Ghunsa passing through Khambachen. After we trace our steps back to Ghunsa we spend the night there. From Ghunsa, we descend through juniper forests and a monastery before we reach Phale. Then, we make a steady descent and cross a suspension bridge to reach Gyabla. As we move forward, we see a waterfall and cross another bridge over Sumbung khola. Finally, we reach Amjilosa at 2308 meters. A short walk from Amjilosa and we encounter a waterfall, pass a small settlement and cross a bridge over Ghunsa Khola. After crossing another bridge, we reach Sukathum. We again trek past several villages along a river till we finally reach Chirwa at 1270 meters. We descend through settlements and lush vegetation. After passing through several villages, we reach Sinuwa. We keep descending and cross a river to join the Pathibhara trail. After passing another village and crossing another suspension bridge, we reach Phurumbu at 1549 meters. As we continue on the Pathibhara trail, we reach Suketar where our trek ends. We spend the night at an elevation of 2420 meters. We take a flight back to Kathmandu. We have enough time to rest and then explore the tourist areas and shop for souvenirs. We enjoy the farewell dinner to celebrate your trip to Nepal. On the last day of the trek, we drop you off at the airport. We welcome you to visit Nepal again to explore all its hidden treasures. Major Meals; Breakfast, Lunch and Dinner by basic Tea house/Hotel menu. Special permit for 3 weeks. 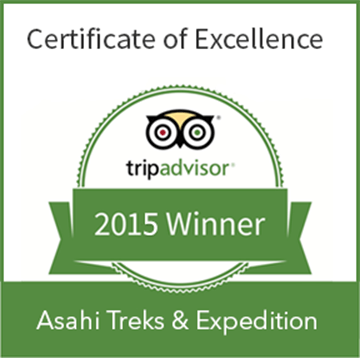 Professional English speaking and license holder Trekking Guide.